I was all set to talk about my favourite shrine in Nagoya, Atsuta Jingu, when I reread the December mini-challenge for Hello Japan! and realised I had to write about temples and shrines in Kyoto. 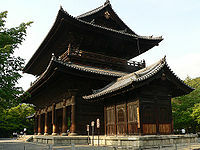 Kyoto is one of the places that all Japanese people would have visited at least once in their lives as it is a popular destination for school and family trips. My family and I used to visit Kyoto when we lived in Japan and although I was young and uninterested in temples at the time, Kiyomizudera with its beautiful wooden structure is one of my favourite temples in the world. However as it is so famous, I decided that I would choose another temple for this task and who better to ask than my mother. 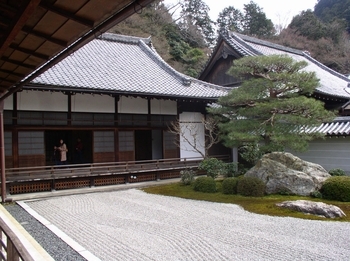 One of her favourite temples is Nanzen-ji with its beautiful zen garden where one can contemplate the nature of life and the universe. Although I don’t remember much of the temple when we visited over twenty years ago, I do however remember the garden with its carefully placed stones representing the islands and the precisely raked gravel representing the sea that surrounds them. Nanzen-ji was built during the middle Heian period in 1291 by Emperor Kameyama on the site of what used to be an imperial palace. A famous story attached to Nanzen-ji is that of Ishikawa Goemon, a legendary hero and thief reminiscent of Robin Hood, who was famously boiled alive in a cauldron for attempting to assassinate Toyotomi Hideyoshi during the sengoku or warring states period in 16th century Japan. Goemon is the subject of many kabuki plays and in the most famous one, in an act titled Sanmon Gosan no Kiri, sits on the roof of Sanmon gate smoking a pipe and enjoying the view. Apart from plays, there are numerous stories and films about Goemon, and he is even credited as an illustrious ancestor of Ishikawa Goemon XIII in one of my favourite anime series Lupin III by Monkey Punch which I used to watch as a child. A re-imagined historical fantasy film Goemon directed by Kazuaki Kiriya was recently released in Japan. I seem to always go off topic, but I love to hear stories that are attached to monuments and buildings which bring their history to life. Even though I was so small, I remember how peaceful it was too. The story about Goemon is great isn’t it? Am already looking forward to your post! My brother got married in Shimogamo Shrine. Do check it out! Wow, I had a look at Shimogami Shrine and it is very beautiful and grand and with such an interesting history. It must have been an experience to be married there. Btw, I didn’t know your family was Shinto! I haven’t really read much about the Shinto religion, but love hearing about all the gods.